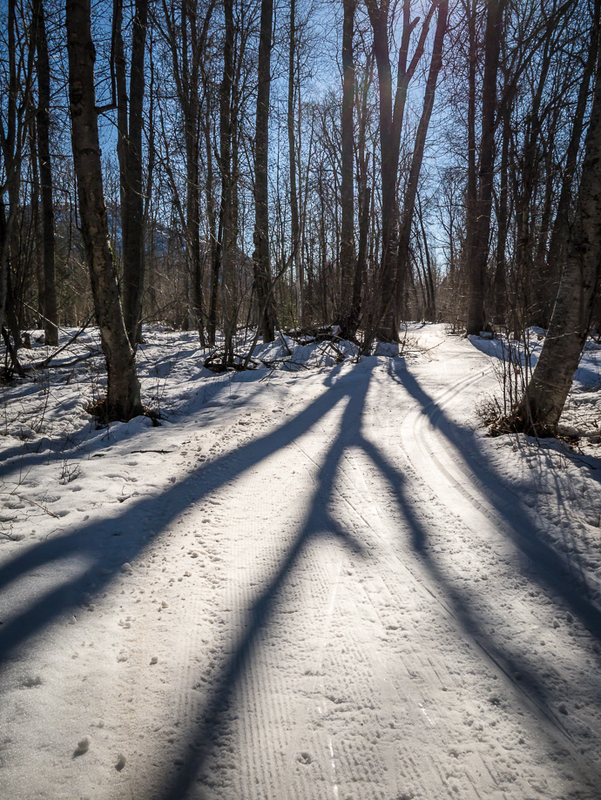 Yesterday a friend and I skied Methow Trails’ Community Trail from Mazama to the Town Trailhead in Winthrop – a distance of thirty kilometers or more than eighteen miles! For some people that’s not a long ways but it is for me. It was sunny and cold. Colder than I usually like to ski. My water bottles froze shut and had to be forced open. Brrrrr. My feet and fingers suffered some, but in the end I was refreshed and exhilarated. The trail winds through the forest and across fields and along the river. 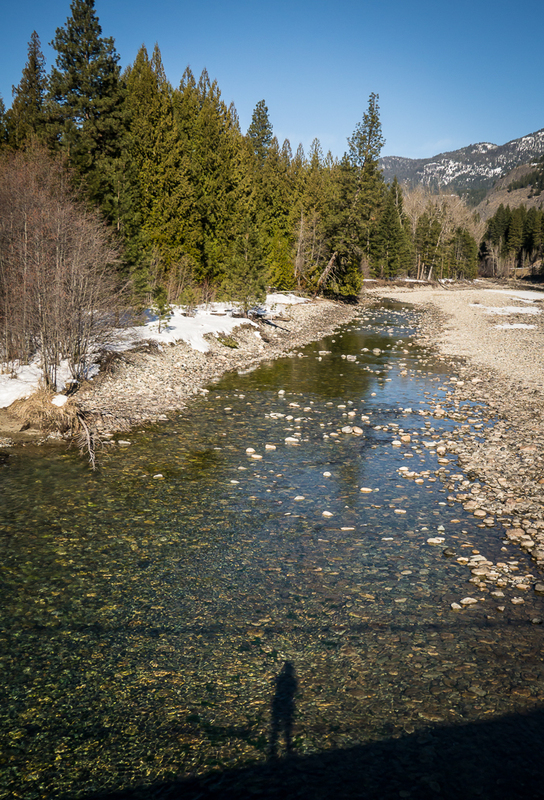 It crosses the Methow River and several streams – Goat Creek, Wolf Creek, Spring Creek and some side channels. With all the cold weather we’ve had, the ice formations are fascinating. Cold weather also makes the skiing slower and more challenging and squeaky too! We did it in almost exactly four hours with one twenty minute break at a warming hut and several shorter breaks. 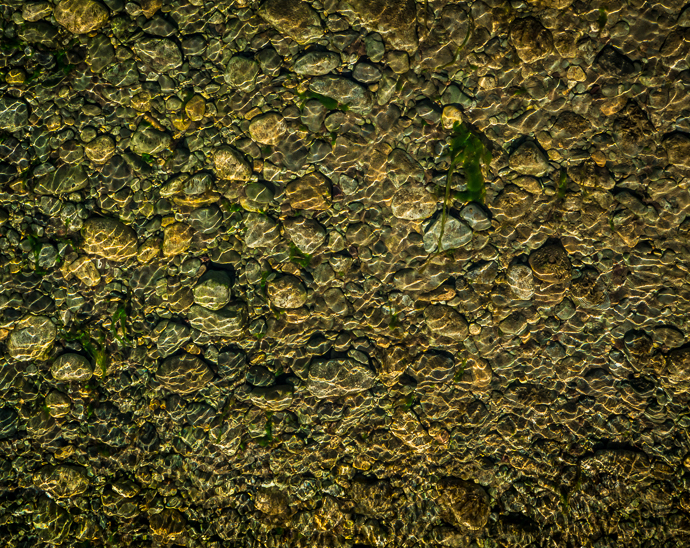 Interesting patterns on Goat Creek. I should have been working today but my boss (me) gave me the day off for fun and exercise. Too much time in front of the computer is not good for any of us. You do know that, don’t you? MA suggested the Cedar Creek Falls trail near Mazama. I’ve only hiked it once before and remembered it as being dusty and at the falls I never got a good view. I think it must have been earlier in the summer with higher water because today we easily got to the top of the falls and the cascades and with some effort, we were able to get to the bottom of one of the tall waterfalls. It looked like there was another below us but it was steep and we didn’t want to let the dogs get close to it. It was worth the dust and horse poop on the trail. The cool mist off the falls felt really refreshing! I wish I could bottle that feeling to use for the rest of the summer. For these photos I was using a gorillapod tripod and Lumix super zoom camera. Not the best gear for moving water but it worked. These yellow flowers were growing out of the cliff to the right of the falls. All of us in one photo! MVSTA is still grooming the ski trails and their website says they will keep going til at least next weekend. 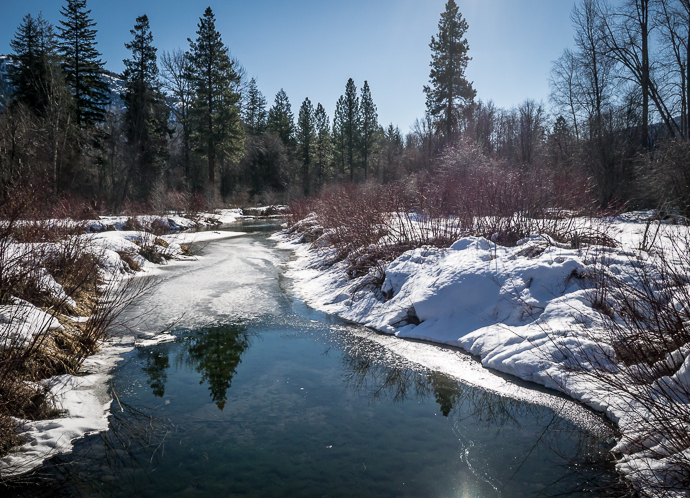 The snow is getting thin in places but the weather is great and the birds are singing and it’s a good time to be out. 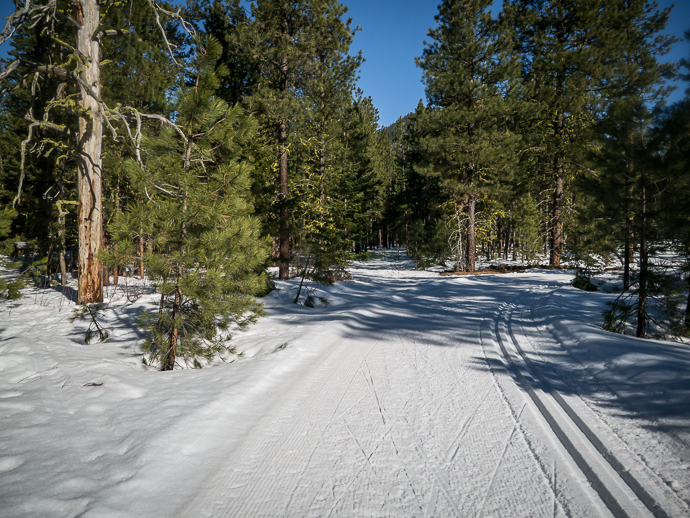 Yesterday I enjoyed a ski on the Community Trail between Winthrop and Mazama – some of it along the river. The American Dippers are singing their little hearts out! Also chickadees, nuthatches, woodpeckers and lots of others are busy claiming their territory. It’s hard to believe that in just a couple of months these woods will be full of the sounds of warblers, redstarts, veeries and vireos. That’s one way to mark changes of the seasons. 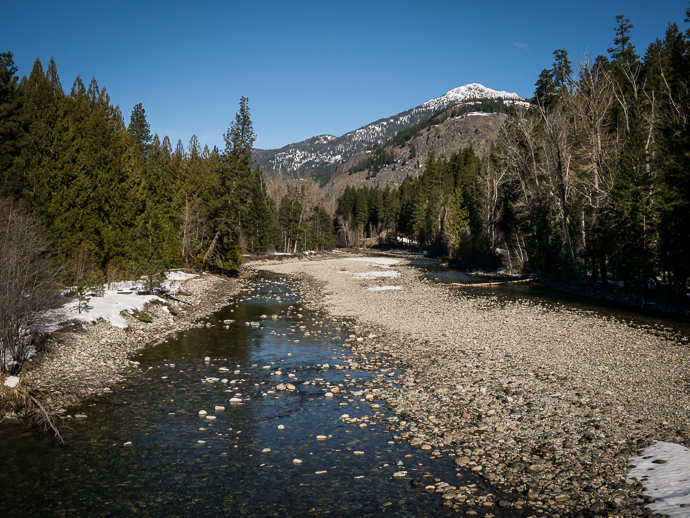 Goat Peak looms above the seasonaly low Methow River. In June it will be full, bank to bank. The clearest water you’ve ever seen. No place for fish to hide. A side channel. I’ve seen a Northern Pygmy Owl here several times this winter. Not yesterday though. 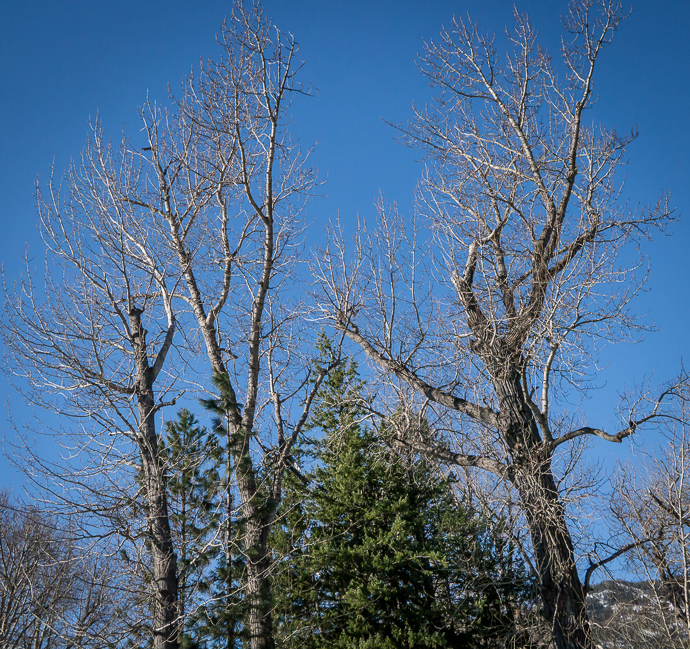 This cottonwood forest provides wonderful songbird habitat in the spring and summer.